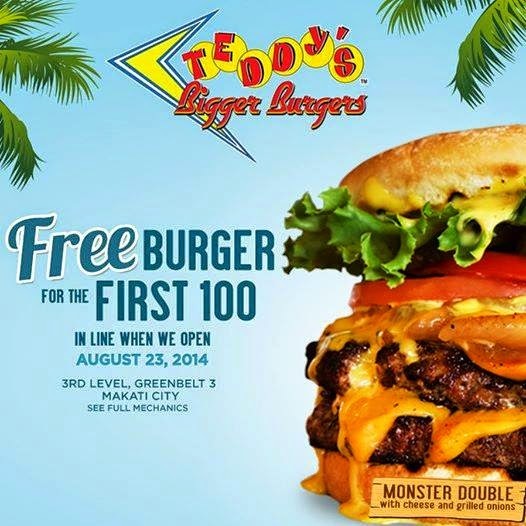 Teddy's Bigger Burgers, Hawaii's Best Burgers is opening it's first store in Manila tomorrow, August 23, 2014! First 5 guests will get 1 YEAR SUPPLY of Teddy's Burgers! First 100 guests will be given free Teddy's 5oz Original Burger. Other burger prizes to be given away! Hurry! Checkout Teddy's Bigger Burgers Store at the 3rd level of Greenbelt 3 in Makati City. Store will open at 11:00 AM. Line starts as early as 7:00 AM!